A happy ending but much happens to Hope and her family. Job loss, relocating, difficult times for her adult children. Hopes' job in a womens correctional facility changes it all. Crafting and more importantly quilting are a large part of this story. We just heard Marie talk in Poulsbo. One of the most engaging and funny authors I've heard. If you've never read Marie before, this book Hope on the Inside is a great place to start. SIGNED copies. 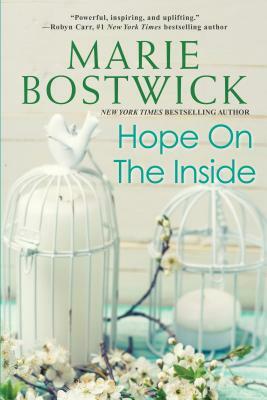 In this compelling, heartwarming novel from New York Times bestselling author Marie Bostwick, one woman finds new purpose in a new phase of life . . .
“Whatever comes your way, find the happiness in it.” Hope Carpenter received that advice from her mother decades ago. Now, with their four children grown, Hope and her husband, Rick, are suddenly facing an uncertain future, after a forced retirement strains both their savings and their marriage. Seeking inspiration and a financial boost, Hope gets a job teaching crafts to inmates at a local women’s prison. At first, Hope feels foolish and irrelevant, struggling to relate to women whose choices seem so different from her own. But with time, and the encouragement of the prison chaplain, she begins to discover common ground with the inmates, in their worries about their children and families, their fear of having failed those who need them. Just like her, they want to make something of themselves, but believe it might be impossible. Embarking on an ambitious quilting project, Hope and her students begin to bond. Together, piece by piece, they learn to defy expectations—their own and others’—and to see that it’s never too late to stitch together a life that, even in its imperfections, is both surprising and beautiful. Marie Bostwick was born and raised in the northwest. In the three decades since her marriage, Marie and her family have moved frequently, living in eight different states at eighteen different addresses. These experiences have given Marie a unique perspective that enables her to write about people from all walks of life and corners of the country with insight and authenticity. Marie currently resides in Portland, where she enjoys writing, spending time with family, gardening, collecting fabric, and stitching quilts. Visit her at www.mariebostwick.com.